The Pleasure Was All Mine	Boy Howdy! These are probably the first photos I ever took, using my Dad’s Kodak Signet 80 camera, which was Kodak’s highest-end camera at that time. It was a 35mm rangefinder camera with interchangeable lenses. My dad picked it up in Mexico City when someone there stole his Nikon rangefinder from his hotel room. At that time, of course, SLR cameras were quite rare; Nikon didn’t offer one until a year or so later. The Signet 80 was a great camera and totally silent, unlike the clunk-producing early SLRs and I used that camera well into the 1970s, even after I had Nikon SLRs and medium-format cameras of my own. 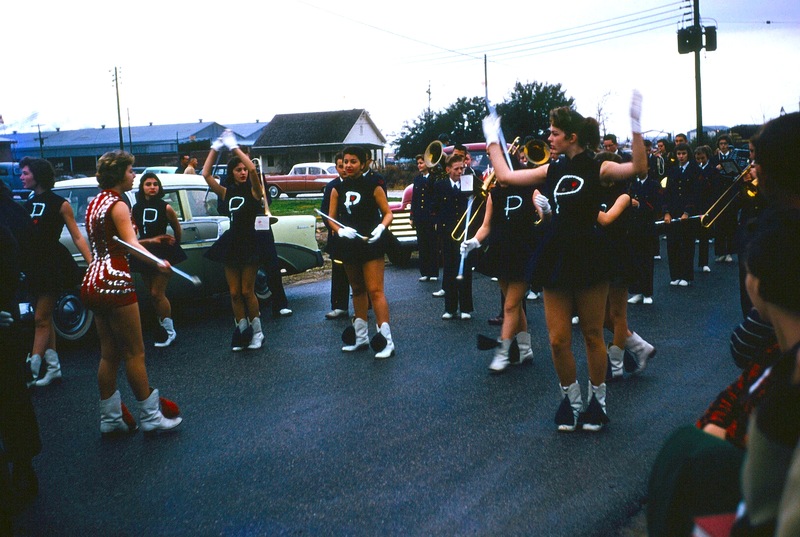 So these were taken in Pascagoula, Mississippi in 1958. I was in the first grade. 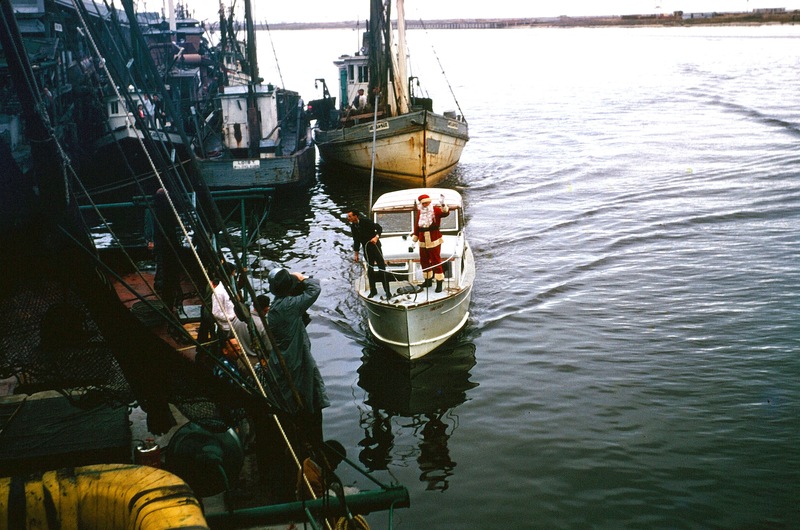 The Christmas Festival that year was a big deal for me, because my dad flew Santa onto the river with his float plane, and a little boat picked Santa up from my dad’s plane and brought him to the docks. Mr. John Quinn, my dad’s friend who owned the menhaden plant mentioned earlier, lifted me up onto a 55-gallon drum because I was little. 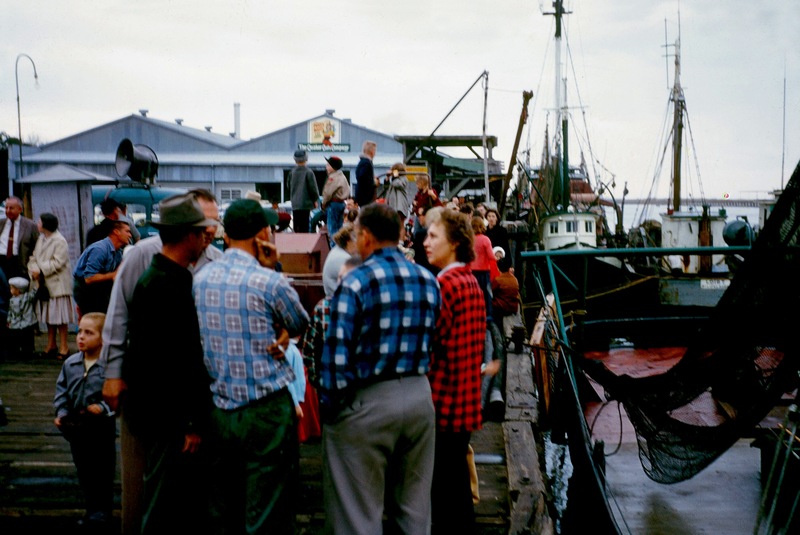 Mr. Quinn is in the dark-blue-black-and-white checked shirt in the second photo, and his wife, Jane, is standing next to him in a red-and-black checked shirt. Here comes Santa on the small boat. In this crowd scene, you can see the Puss ‘n Boots cat-food factory in the background. That’s where I learned to ride my bicycle; there was a big concrete area in front of the factory which was vacant on the weekends. I had gotten a seven-transistor radio from Western Auto (it was sapphire blue) and I taped it to the handle bars of my bike so I could listen to WTIX (Tiger Radio!!!) from New Orleans as I rode around. They played Elvis and Chuck Berry and especially Buddy Holly. In this photo, you can see the Pascagoula High School Marching Band. Hard to believe these lovely young ladies would be in their 70s today. Mr. Jim, I’m very interested in talking to someone about the Pascagoula fisheries from back in the day. Not sure I have a lot of info about those fisheries, but I might be able to assist you. Steve, sending you a private email!